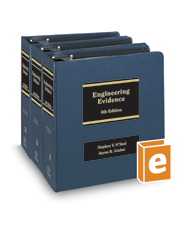 Engineering Evidence, a multi-volume treatise, includes coverage of statutes and case law with nationwide ramifications for establishing liability and estimating damages. Discussion of practice-proven techniques for selecting an engineering expert, presenting an expert for trial, introducing expert testimony effectively, and challenging the opposition’s experts. Includes a directory of expert sources for locating professional societies to aid in your selection of an expert witness.